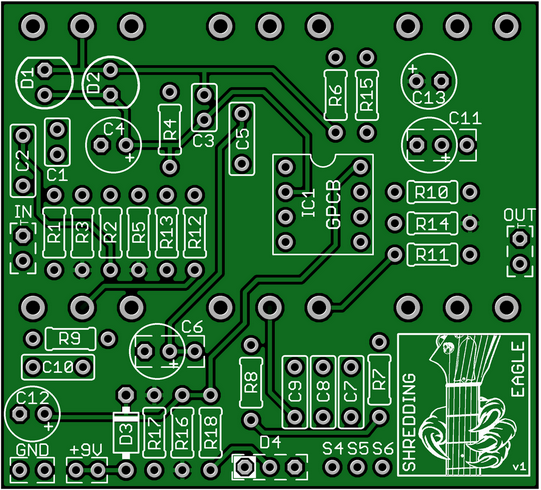 This kit includes all of the parts needed to build the GuitarPCB Shredding Eagle project. This is an extremely versatile 6 knob overdrive. This circuit features a presence control and 3-knob equalizer tone control, giving you an overwhelming amount of flexibility in your tone. The overdrive goes from mild to mean to scream in the turn of a knob! This kit includes a 125B-size enclosure and Davies 1900H-style knobs. All of the potentiometers are PCB-mounted, eliminating the need for 18 wires from the board to off-board pots. Note that if you order this kit with a pre-drilled enclosure, it will be drilled to accommodate a 3PDT wiring board, which means that there will not be room for a battery inside the enclosure. Our kits include a jack for a DC power adapter but no battery snap. If you wish to use an internal battery, please add a battery snap kit to your cart in addition to the pedal kit, and either 1) add a note in your order requesting for an enclosure drilled to accommodate a battery but no room for a 3PDT wiring board (you'll have to hand-wire the 3PDT switch) or 2) Order the kit with an un-drilled enclosure and drill the holes yourself. Please see what is provided in a kit? in our FAQ for more details of what is included and what you will need to provide to complete the project. Pedal Parts and Kits is not associated with and makes no claims to any trademarks named on our site other than our company name, Pedal Parts and Kits™. See our FAQ for more details.